The mission of the Institute for Global Leadership is to prepare students to play active roles in their communities, whether at the local, national or global level. As such, the IGL plans to bring alumni back to Tufts regularly to share their experiences as part of the IGL Alumni Careers Series. 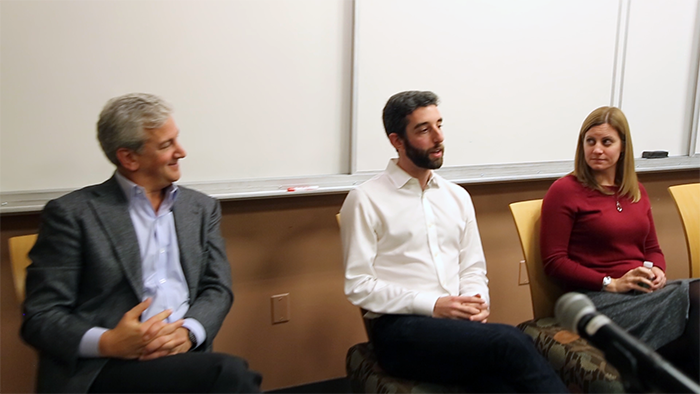 This November, three alumni – Brad Bernstein (EPIIC’89, A’89), Anne O’Loughlin Bosman (EPIIC’02, A’02), and Stephen Gershman (EPIIC’09, Empower’10, A’11) – inaugurated the series with a focus on the business sector, including start-ups, social entrepreneurship, enterprise technology, financial services, strategic partnerships and international business. The alums shared stories from their respective journeys and offered advice to current students as they consider life after Tufts. Brad began his presentation by posing the question: “Why are there so many successful, big innovative companies in America (i.e Facebook, Tesla, Amazon, etc. )?” He believes that one of the main driving factors for this phenomenon is the unparalleled capital markets in the United States. No other country, he explained, has the breadth of financing available, from angel investors to venture capitalists and everything in-between. He points to the fact that Tesla has never made a profit, yet has raised billions of dollars, noting that there is a lot of good that comes from liquidity and capital markets to help support entrepreneurs, despite what some may believe. Fortunately for him, studying abroad in China as an undergraduate made him attractive to investment banks, and he managed to secure a spot in a training program. He said he literally knew nothing about finance when he started. He said that many showed up asking when they were going to go to a board meeting or fly in a private jet, where he said he was offering to get a cup of coffee or make copies, which, over time, let him distinguish himself from the other trainees. He then talked about why growth equity was like his experience in EPIIC. There are four key things to making a deal: first, you have to be analytical; second, you have to be good at judging people and be a little bit of a psychologist; third, you need to be a negotiator who can make the deals, someone who enjoys haggling with a car salesman; and fourth, you have to be able to synthesize the information, to put it all together to make the deal. He said that when you think about those components and discussing with his partners 0ver whether to make an investment, it’s kind of like an EPIIC class trying to make sense of all the information and make the best decision possible. “I don’t think the word business was even in my vocabulary while I was at Tufts,” Anne began. She was a double major in history and Spanish who wanted to travel the world. She ended up in business accidentally, but her career’s story began with EPIIC. Having enrolled in the EPIIC year on “Global Inequities”, she felt passionately about the topic of her class research paper about sweatshops and the labor migration crises in Southeast Asia. The Institute supported her travel to Taiwan to continue her research, which is where she first connected with her advisor, a social justice activist and entrepreneur. He was in the early stages of starting a business, and with Anne onboard, they grew his idea into a multi-million-dollar, social enterprise based on fair wages and fair trade. From there, she followed her passion for the next decade and set out on the track of social enterprise, which was “barely a thing” back in 2002. She said, “Corporate social responsibility was barely a concept let alone a readily understood concept or something that consumers would have on their minds” then. After ten years of working in the boot-strap world of social enterprise start-ups, she felt she needed to step back, take a breather and add to the soft skills she had developed at Tufts. She wanted to develop the hard skills – e.g. financial planning, profit and loss management – of an MBA, which she earned at Babson College. Following that, she worked at Harvard Business School at HBX, a very different experience in a very old, established institution. She then jumped back into the start-up world, but this time with money. General Assembly is backed by venture capital. Anne currently serves as the New England Regional Director for General Assembly, a tech education organization working towards closing the global skills gap and diversifying the tech talent pipeline. She loves that working in social enterprise means working in a fast-paced environment that requires multitasking, creativity and innovation among many other things. Stephen Gershman came to Tufts wanting to be a diplomat. Early on, he worked as a summer intern in the U.S. Congress, where he was confounded with the antiquated systems in place that he saw as preventing people from getting their jobs done. While in Washington, Stephen became interested in social entrepreneurship after meeting the people who had just started a pilot program at Georgetown called the Compass Fellowship. This fellowship was designed to train students to be social entrepreneurs. He brought this program to Tufts in his junior year, affiliating it with the Institute’s Empower program. Within a few years, Stephen became the Boston Regional Director and Compass became a company, Social Impact 360, that is now on about 15 campuses. The initial presentations of the alumni were followed by a question and answer period. Some of the questions from the students involved how the alums addressed work-life balance, as what mistakes they felt they made in their careers and how they learned from those experiences, and what skills do they look for when they are hiring new workers.